House Sitter Timers Will Randomly Turn Things On And Off While You're Away From Home | OhGizmo! In what scientists call the ‘Home Alone Effect’, people seem to think that while they’re vacationing in Florida for a month they can fool bumbling burglars into believing they’re actually still at home home by leaving a light or a TV on. I tend to give those who are planning a B&E a bit more credit, and would instead opt for something like these House Sitter timers. 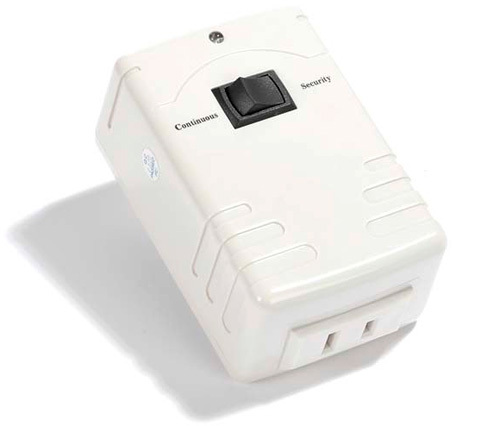 They plug into a standard power outlet and feature a simple switch that can be set to ‘Continuous’ allowing you to operate the connected device as normal, or ‘Security’ which will automatically turn the connected device on and off in intervals ranging from 9 to 34 minutes. Frankly, the timer seems a bit big considering what little it does, but at just $14.99 a pop from Smarthome it’s not that expensive to install a few of these around your home the next time you plan to be away.